I’ve been putting up photos for friends and family for the past decade, and created a number of differently designed pages for them over the years. A while ago I started to work on bringing the photos together in a new photoblog. 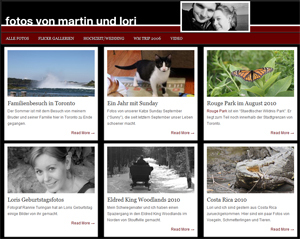 I had first considered adding the old photo galleries to martinhofmann.net here. But then I decided to organize all the old photos in a new, separate WordPress blog with a gallery plug-in and a nice overview homepage. I will continue to use if for new photo galleries but keep the actual blogging here. The photoblog is still a bit of a work in progress but it’s getting there. I like the layout from the StudioPress template that gives it all a consistent look & feel. It was fun to go through all the old HTML-pages with my different amateur design approaches. As much as I posted the photos for Lori, my friends and family to see, half the fun was definitely in fiddling around with HTML. Click on the image of the screenshot with the new design or here to go to the new photoblog.